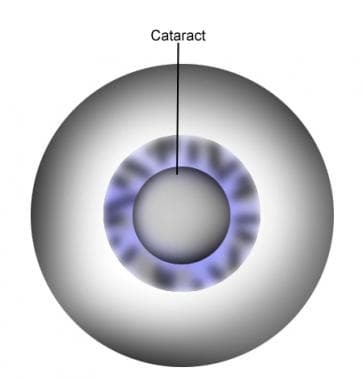 A cataract is illustrated in the image below. Phacoemulsification is illustrated in the image below. Cataract surgery phacoemulsification, phaco, nucleus. The most common indication for cataract surgery via phacoemulsification with intraocular lens implantation is the patient's desire to improve vision. If a patient's best corrected visual acuity does not meet government agencies and industries minimum standards of visual function for tasks for driving, flying, or operating complex equipment, cataract surgery via phacoemulsification with intraocular lens implantation may need to be considered. An abnormally irregular, dim, or absent red reflex is seen when the retina is viewed with an ophthalmoscope at arm's length. Nuclear and posterior capsular cataracts cause a central black shadow across the red reflex. 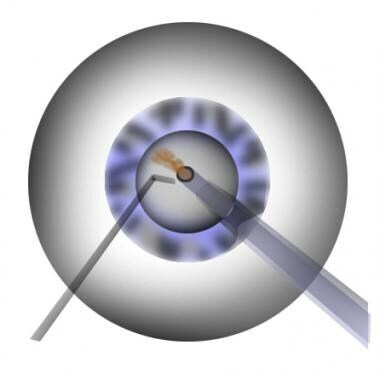 Cortical cataracts cause black spokelike shadows coming from the edge of the red reflex. Reduced contrast sensitivity can be measured by the ophthalmologist using contrast sensitivity charts. Very dense "mature" cataracts causing severely impaired vision cause a white pupil. After pupils have been dilated, slit lamp examination shows whether the cataract is cortical, nuclear, or posterior subcapsular and allows fundus examination. Cataract in children is unusual but may be associated with a white pupil, inability to fix on a target (eg, a light) and the development of a squint. Low endothelial cell count is a contraindication. Bobrow JC, Blecher MH, Glasser DB, et al. Surgery for Cataract. Lens and Cataract. 2010-2011. Singapore: American Academy of Ophthalmology; 2010. Section 11: Chap 8. Waheeb S. Topical anesthesia in phacoemulsification. Oman J Ophthalmol. 2010 Sep. 3(3):136-9. [Medline]. [Full Text]. Gupta SK, Kumar A, Agarwal S. Cataract surgery under topical anesthesia: Gender-based study of pain experience. Oman J Ophthalmol. 2010 Sep. 3(3):140-4. [Medline]. [Full Text]. Anderson NJ, Woods WD, Kim T, Rudnick DE, Edelhauser HF. Intracameral anesthesia: in vitro iris and corneal uptake and washout of 1% lidocaine hydrochloride. Arch Ophthalmol. 1999 Feb. 117(2):225-32. [Medline]. Chee SP, Chan NS, Yang Y, Ti SE. Femtosecond laser-assisted cataract surgery for the white cataract. Br J Ophthalmol. 2018 Jun 15. [Medline]. Yanoff M, Duker JS, eds. Small Incision and Femtosecond Laser Cataract Surgery. Ophthalmology. 4th ed. Elsevier; 2014. 371-77. Arnold AC,. Basic Principles of Ophthalmic Surgery. USA: American Academy of Ophthalmology; 2006. Kohnen T, Koch DD. Cataract and Refractive Surgery (Essentials in Ophthalmology). Germany: Springer; 2005. Leaming DV. Practice styles and preferences of ASCRS members--2001 survey. J Cataract Refract Surg. 2002 Sep. 28(9):1681-8. [Medline]. Alio JL, Fine IH. Minimizing Incisions and Maximizing Outcomes in Cataract Surgery. Germany: Springer; 2010. O'Brien JJ, Gonder J, Botz C, Chow KY, Arshinoff SA. Immediately sequential bilateral cataract surgery versus delayed sequential bilateral cataract surgery: potential hospital cost savings. Can J Ophthalmol. 2010 Dec. 45(6):596-601. [Medline]. Yanoff M, Duker JS. Ophthalmology. 1st ed. London: Mosby; 1999. Olver J, Cassidy L. Ophthalmology at a Glance. London: Blackwell Science; 2005. Seibel BS. Phacodynamics Mastering the Tools and Techniques of Phacoemulsification Surgery. 2nd Ed. 1995. Cataract surgery incision, (1.9-2.75 mm), corneal incision, limbal incision, clear corneal, small incision, sutureless. Cataract surgery capsulotomy, capsulorrhexis, continuous tear. Cataract surgery, phacoemulsification, divide and conquer, phaco, chop. Cataract surgery with phacoemulsification cross-section. Cataract surgery illustration of cortex and capsule cleanup using IA. Phacoemulsification with cortex removal. Phaco, aspiration, cataract surgery illustration. Cataract surgery, lens insertion, 3-piece, IOL, intraocular lens implant, shooter, inserter. Intraocular lens implant, IOL, 3 piece lens, in the bag. Cataract surgery illustration with ruptured posterior capsule. Anterior vitrectomy for ruptured posterior capsule during phacoemulsification. Femtosecond laser assisted corneal incisions, capsulotomy, and nucleus fragmentation.